For the PERC 5/i, you can find the last drivers/firmware on Dell's website. Look under downloads for the "Poweredge 2900 ". For the PERC 6/i, you can find the last drivers/firmware on Dell's website. Look under downloads for the "PowerEdge R900". These cards are known to have some compatibility issues with Intel chipsets. However, they are known to work with NVIDIA motherboards fine. The issue stems from a System Management Bus (SMBus) conflicting with the motherboard's memory detection. SMBus is simple signal to provide the motherboad some basic device information and control. Symptoms of the conflict includes improperly reported RAM sizes and POST errors. The Tj maximum temperature is 110C. However, do NOT run the IOP333 passively. The heatsink needs force airflow. Intel's thermal analysis used a heatsink of the same size but with more fins (hence better). However, they require a minimum of 200LFM with there heatsink. Over the surface the PERC stock heatsink, that is at least 4CFM. Do realize that if you used a 80mm fan, you would need a higher CFM rating of around 16CFM. This is assuming that the 80mm fan is next to the HS. 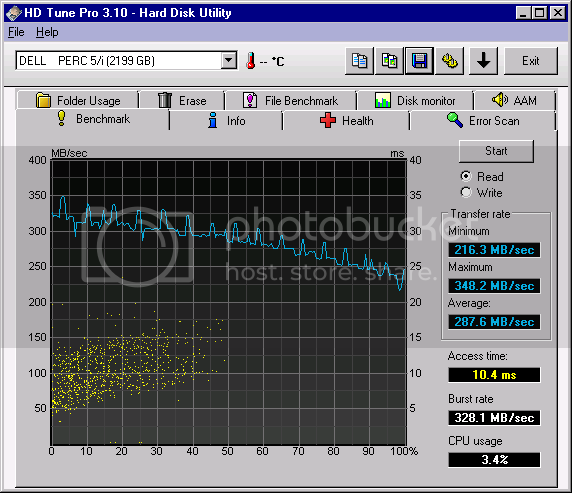 Bottom Line: Make sure to force air cool the PERC 5/i CPU. The card is designed for Dell servers with forced air. Note: Since the card uses a Dell Bootloader, there is a possible corruption as defined in Post #1343 (link). It is recommended that you use the Dell firmware unless it does not work. The LSI version of this card is kept more up to date with bug fixes. Also, the LSI version has more software features so might as well get the better model. 1) Download and extract the LSI flashing utility "MegaCLI - Windows"
*The LSI firmware (7.0.1-0068) may cause the card to not be recognized on some systems. Reverting to 7.0.1-0051 or (supposedly) 7.0.1-0056 should resolve the issue. This IOP heatsink is mounted using via the spring-loop mount. This type of mount was used on older chipset and is not common today. In addition, the older chipsets used 3" loop spacing but this card uses 2.5" spacing. Therefore, it is almost impossible to find a low profile heatsink that will fit on this cards. Note: This option is no longer available in the latest Firmware. To get maximum performance, you will need a Battery Backup Unit. The card will display the following message if a battery unit is not used/working. These batteries power the card and the RAM in case of system power loss. It lets the card clear out the RAM to prevent data loss/corruption before shutting down the HD. "The battery hardware is missing or malfunctioning, or the battery is unplugged. If you continue to boot the system, the battery-backed cache will not function. Please contact technical support for assistance. Press 'D' to disable this warning (if your controller does not have a battery)." Just press D and the message should not appear again. If it does, update your firmware. Read Ahead: system tries to predict what part of files will be needed and preloads them into memory. This boost sequential performance but hurts random performance. 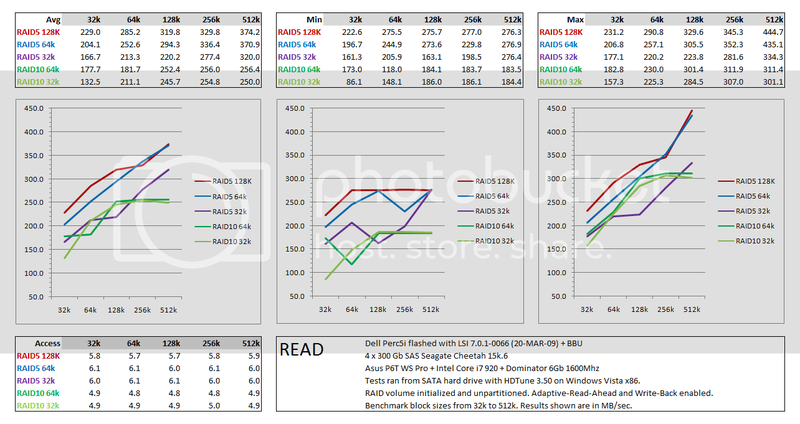 Adaptive Read Ahead: Read Ahead when memory and I/O avaliable with prioritization. 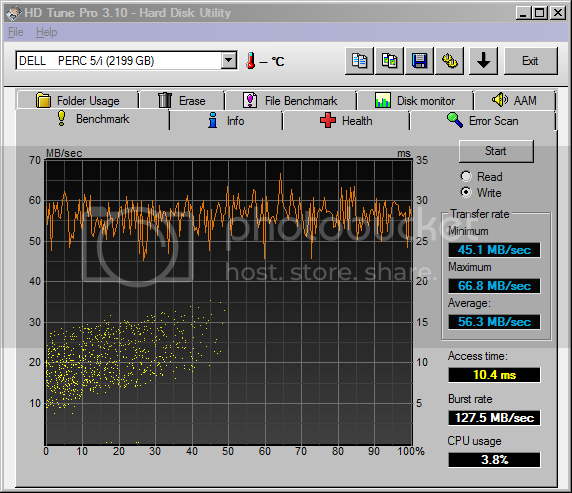 Balances sequential and random read performance but takes processing power. Write Through: Writes from memory to HDs are performed only when the data is complete. Data is not accessible until written to HD. Write Back: Writes are stored in memory and can be accessed from faster RAM. Data is written to HD when optimal. 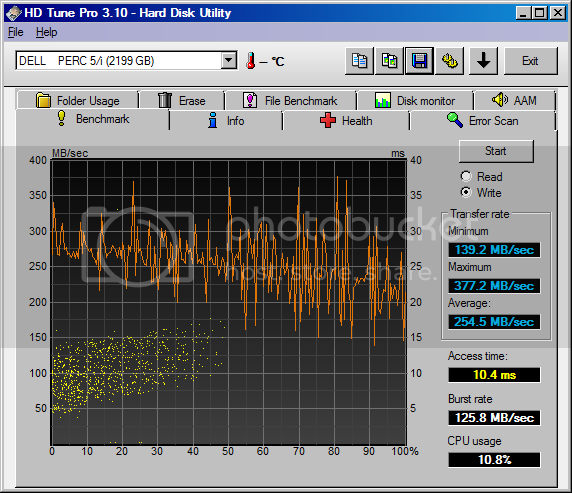 Performance increases but data is at risk in volitle memory. If power is lost, the stored data in the RAM is lost and never written to disk. 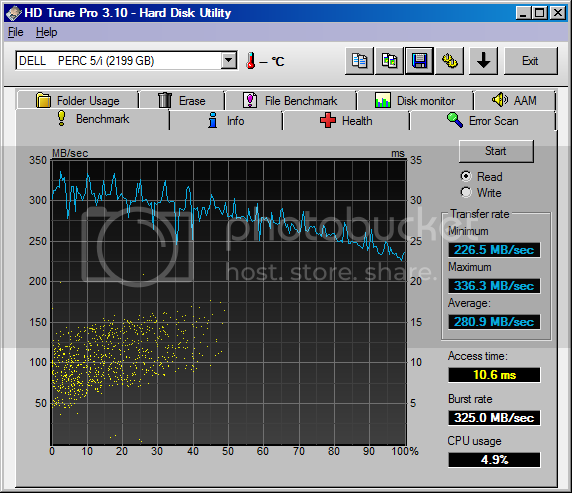 Degraded: RAID5 can operate with one HD missing. Performance is heavily impacted due to parity calculations. 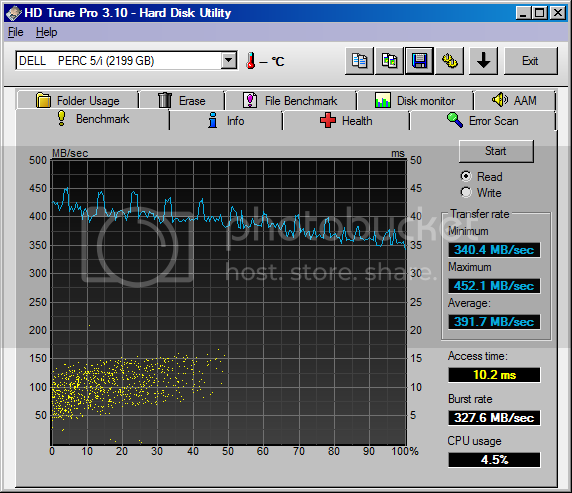 RAID5 write speeds went from 55MB/s to 121MB/s. 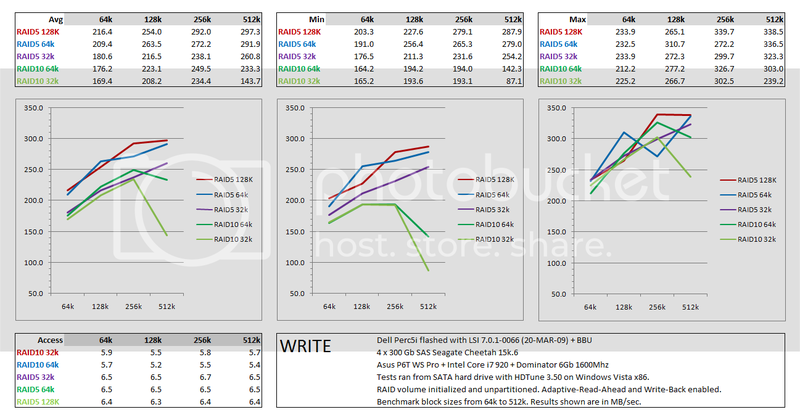 RAID5 read speeds remain about the same but much more consistent. RAID0 write speeds went from 165MB/s to 180MB/s but less consistent. RAID 0 read speed went from 162MB/s to 182MB/s and MUCH more consistent. CPU usage was greatly reduced and access time generally only slightly improved. Please remember this are artificial tests that focus more on sequential performance. The poor performance is probably due to the 64KB block sizes used in the test. The controller had to access 8 sectors to retrive each block. I used a copper RAMsink on the RAID processor and a Thermaltake Spirit HS for the EC-RAM (courtesy of s1rrah). The card does get quite hot and I am thinking about replacing the CPU's HS. 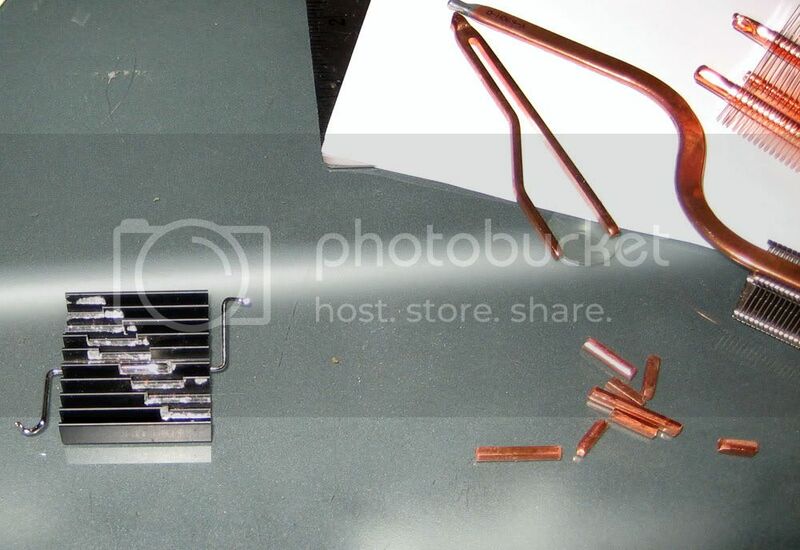 Stock heatsink routed and cut up pieces of copper from a soldering tip. Arctic Silver Adhesive to hold it together. I have used that card in a couple of customer builds and it is the same logic built into the high end Dell Workstations. Do these run hot? I know Intel's new dual-core IOP (found on Adeptec's cards) run VERY hot at 80C+. Aftermarket cooling is recommended on those cards since they are known to thermal shutdown. I've seen someone watercool his RAID controller b/c of this... seriously. got my card! Updated pics. Benchies coming after I get my cables. This looks pretty sweet. I think I'm going to get one for my Home Server. The guy on Ebay is about 2 miles from where I live. Thanks Duckie! Edit: Do you think you take some shots of the ports and such? Aumotocnic"An unfortunate member of the overclock.net insomnia club"
In most cases, you don't need one of these for a home server. These would be over kill in most cases. Updated directions to flash it to a LSI MegaRAID SAS 8480E. Any idea of improvement over onboard RAID setups? With RAID5 or large arrays, performance gain is massive... I am waiting for my cables before I can start bench RAID0. Dude this is awesome, other cards with an IOP333 are extremely expensive, ESPECIALLY the SAS ones!!! !